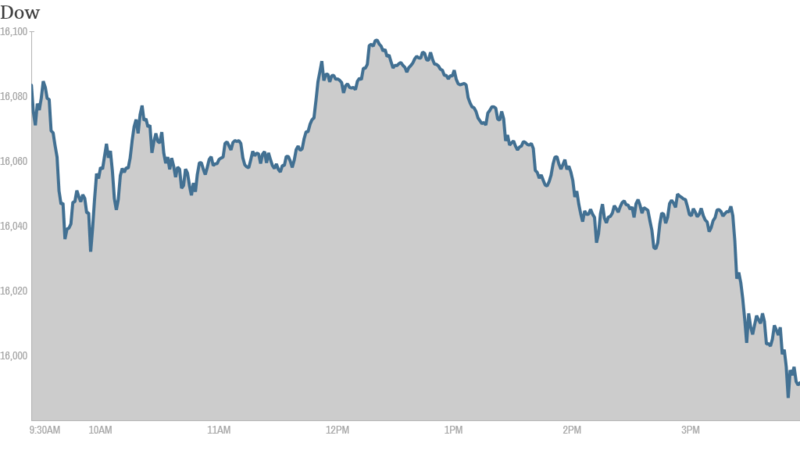 Stocks slid in the final hour of trading Monday as weak holiday sales raised concerns about the state of the consumer. The Dow Jones industrial average, the S&P 500 and the Nasdaq all ended lower. Despite the selling, the Dow managed to close above 16,000 and the S&P 500 held 1,800. But both indexes briefly dipped below those psychologically important levels in the last few minutes prior to the closing bell before recovering. Why the sell-off? There wasn't a lot of economic or corporate news Monday. But the National Retail Federation did report that shoppers spent an average of 4% less over the holiday weekend, the first decline in spending since 2009. Shares of J.C. Penney (JCP), Coach (COH) and Urban Outfitters (URBN) were lower. Given the underwhelming Black Friday sales, investors will be watching Cyber Monday shopping figures for further clues about the health of the U.S. consumer. Amazon (AMZN) made headlines after CEO Jeff Bezos said the company is exploring a drone-based delivery system for some shipments. The plan is in the early stages and faces regulatory hurdles, but investors on StockTwits seemed pleased with the attention it generated. "Congrats to $AMZN #Amazon for their drone buzz. .In all media now," said ForexAccountManagers. Shares of Amazon gave up early gains and turned lower at midday. Some investors were questioning whether the Prime Air delivery service makes economic sense. "$AMZN #Amazon probably down,because people who saw 60 MIN,figured this bezo dude is nuts<I mean really?there going to fly 1K's of drones?LOL," said 1991previa. But one trader joked that they liked how enthusiastic Bezos and wished for more of that from Apple (AAPL)CEO Tim Cook. "$AMZN bezos is the biggest cheerleader for his company. i wish tim cook would do the same=show more excitement," said deskpros123. Still, shares of the iPhone and iPad maker have bounced back recently. The stock has clawed back from about $400 over the summer and now trades above $550. 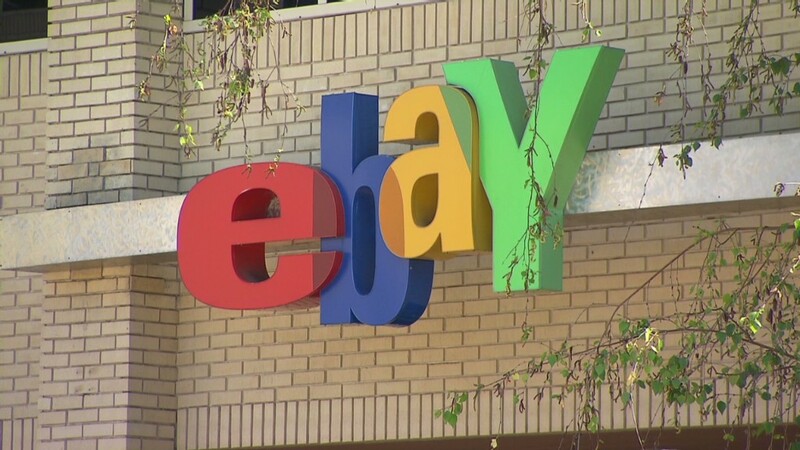 Shares of eBay (EBAY) were lifted by hopes the online auction company will benefit as consumers look for bargains this holiday season. "I'm going to do all my shopping today on $EBAY - every little bit counts!" said crosenfield. In economic news, the Institute for Supply Management said its manufacturing index rose 0.9% in November, the sixth month in a row of growth in the sector. The report points to fourth-quarter economic growth of 3.5%, according to Amna Asaf, an economist at Capital Economics. The manufacturing data kicks off a heavy week of economic news. The November jobs report is due Friday and that could give investors a better sense of how much longer the Federal Reserve will maintain its massive stimulus program at current levels. Other reports this week include auto sales, the second estimate of third quarter GDP and weekly jobless claims.